Dr. Simpson received his doctorate in Counseling from The University of North Texas. 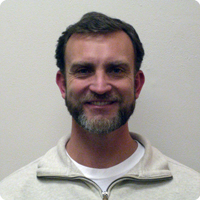 He is a licensed professional counselor (LPC) and a national certified counselor (NCC). He currently teaches at Texas A&M University/Commerce as well as maintaining a private practice. He has practiced in community agencies since 1998. Dr. Simpson has been trained in Gestalt therapy and play and activity therapy. In his private practice, he works predominantly with children and adolescents using play and activity therapy and expressive arts interventions. Dr. Simpson has worked with a variety of populations including: persons recovering from chemical dependency, theft intervention, self-injurious behavior, and grief recovery. He is currently involved in research studies on self-injurious behavior in secondary school settings and the use of camp experiences in grief work with children.